It's that time. Gas prices are once again at record high levels. The usual suspects, and their media partners, are pointing fingers and blaming everyone but the right people for the situation. The map above from API shows gasoline taxes by state (combined local, state and federal), which range from a low of 26.4 cents per gallon in Alaska to a high of of 66.1 cents per gallon in California, averaging 48.1 cents per gallon across all states. How does that compare to oil company industry profits per gallon? According to this post on Exxon Mobil’s Perspective Blog , "For every gallon of gasoline, diesel or finished products we manufactured and sold in the United States in the last three months of 2010, we earned a little more than 2 cents per gallon. That’s not a typo. Two cents." Exxon also reports that in 2010 it "made less than 8 cents for every dollar of revenue from all of our businesses around the world." 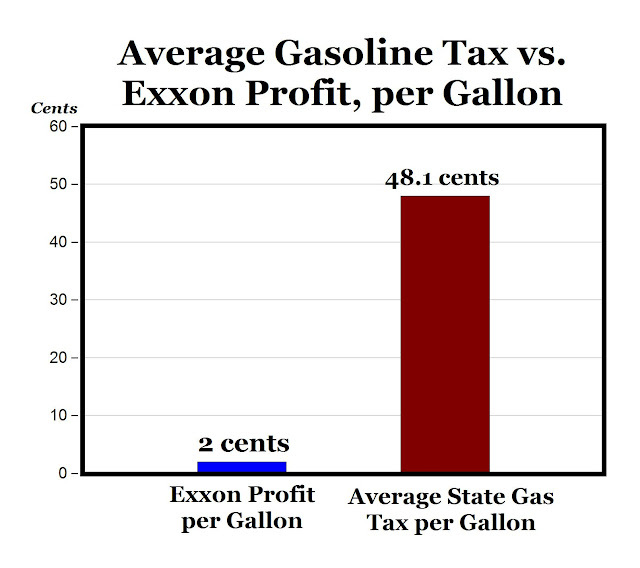 As the data shows, state and federal per gallon sales taxes on gasoline are, on average, 20 times higher than the oil companies profit margin, per gallon. Understand, the government doesn't have any risk involved. They aren't risking billions to explore for the oil. They aren't forced to shut down projects that are about to pay off, thus losing billions, on the whim of a tyranical government. The government creates nothing. They just stand there with their hand out demanding 20 times oil company profits from each consumer, just because they can. Oh, I know, the government is supposed to use gasoline taxes to build and maintain roads, and other infrastructure, but if that was true, why did the Obama regime need to pass a trillion dollar stimulus package to build and maintain roads? After all, while oil companies are raking the profits in, the government is raking in 20 times more, at least! I can see it now: "But, Gary, the evil oil companies are making record profits. You're just a shill for the man!" If only, I'm sure that pays very well! The progressives, who hate fossil fuels anyway, always blame the oil companies when prices spike. They are an easy target because, in fact, they do make more money than just about any other business on the planet. They also have a product that everyone uses one way or the other. Stands to reason they'll make big bucks, doesn't it. Of course, people seem to forget these same "evil" corporations also lose money, and they lose it by the billions. Earlier this week we reported the Obama regime forced Shell to shut down a drilling operation in Alaska. Shell had $4 billion invested in that deal, and had yet to hit oil. That's $4 billion they may as have well just flushed down the toilet! Oil companies make big money, but they also have big risks. They spend their money billions at a time, and they don't always win. High risk enterprises deserve to make good money for their risks. It's how things work. Something else to remember. That $4 billion Shell was screwed out of by the Obama regime wasn't Shell's money to lose. You see, when the radical left, the anti-capitalists, the environmental crazies, and all the rest start bashing "Big Oil" and those "evil" corporations in general, they seem to forget who actually owns these companies. The PEOPLE own these companies. People like you and I who have 401Ks, or mutual funds, or maybe just own stock in companies outright. These aren't "the rich" either. Most people in what we consider the middle class, and even some in what we consider lower class have a buck or two invested. So who gets hurt when the Obama regime, or anyone else does things like what was done to Shell? Everyone, that's who. So...., why are the companies making record money? The easy thing to say would be "volume, volume, volume" but it's more than that. People forget that gasoline, isn't the only thing the world uses petroleum for. A significant portion of every barrel of oil produced is used to make other products such as plastics, fertilizers, nylon [and every other synthetic fabric], pharmaceuticals, and much more. Profit margins on raw materials vary, and it's still a business based on volume, but there are more uses for petroleum than just gasoline and lubricants. And before you start beating up on the gas station owners, they aren't making big margins either. This I can speak to from first hand knowledge. When I was a kid my dad owned services stations. Several locations and several brands over the years. This was back in the day when they really were service stations. The kind that checked your oil, checked your tires, wiped your windshield, all while pumping your gas for you. In the later years, as my dad had to slow down due to health reasons, and I ran the business and kept the books. 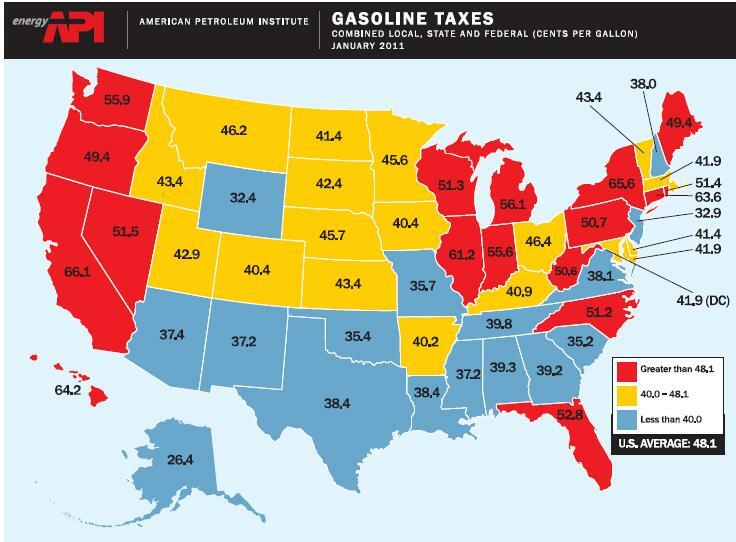 I can tell you, gasoline sales weren't much of a factor to the bottom line. The money was made in service. Tire and battery sales, light mechanic work, and routine maintenance work paid the bills. The gasoline pump just helped you build a loyal clientel who would trust you to do all of their work. Oh, and once the convenience stores started selling self service gasoline at break even prices, things were even worse for businesses like ours. They drove true service stations out of business. Now the convenience stores certainly make money on gasoline sales these days, but it's all about volume sales, and the hope you'll come inside and buy something, something usually marked up higher than you'd pay at the grocery store. So why is the price of gasoline so high at the pump then? There are real culprits, for sure, but they aren't the evil oil companies, or even speculators. And while someone, somewhere, might be "price gouging" their effect is negligible, if these people even exist. Of course, rather than go after the real culprits, Obama, like all liberals, will blame price gouging and speculators, as well as the oil companies, in order to take everyone's focus off the real reasons why gasoline is pushing $5 a gallon at the pump. The concept of supply and demand is as old as the existence of commodities themselves. Whether we are talking bartering how many goats or chickens for a bushel of wheat, or a bag of rice, or how many dollars for a barrel of oil, commodities have always been bought and sold, bartered and traded based on supply and demand. How much, or how little of a commodity is available, always determines it's worth. It's pretty simple, but since neither Obama, nor most of the people surrounding him, have ever run a business as complicated as a lemonade stand, they are having a hard time with this centuries old concept. It stands to reason with the Obama regime's moratorium on drilling, insanity all over the Middle East, and developing nations like China and India devouring record amounts of oil [for them] that the demand is taxing the supply. We know that the United States more fossil fuel reserves than any other nation on the planet, and could become totally energy independent quite easily, but that would be too much like right, wouldn't it? The other problem making gasoline prices skyrocket is the Fed's insane QE2 program. The Obama regime is allowing the Fed to monetize the debt, just print money, with nothing in reserve to back it up. This is something Sarah Palin warned us about last year, and unfortunately everything she warned us about has come to pass. Thanks to the Fed's policy of quantitative easing, which is endorsed by Obama, everything costs more, including gasoline, simply because the value of the dollar is less than it was before the Fed went down this dangerous path. Then there is our energy policy, or lack there of. We haven't had a coherent energy policy in my lifetime. I'm not talking about some insane environmental policy based on faulty, and often made up "science," I'm talking about a serious policy for energy exploration in order to secure not only the economy, but the nation as a whole. All economies run on energy. No energy, or overly expensive energy, and economies collapse. This isn't rocket science. Who's to bear most of the blame for that pain you feel at the pump? As is usually the case, the government. Republicans and democrats alike have caused this. No one has the guts to tell the radical leftists to just sit down and shut up, and no one has the courage to take on lobbyists and other corrupt elements of the industry. Look, we haven't built a new refinery since the 1970s, and now it looks like we are not going to build new nuclear plants anytime soon. Oh, and forget coal, even though it's by far our most abundant source of energy. Cheap energy. The "green" activists have held the nation hostage for decades. They are constantly scheming for new and creative ways to destroy "evil" energy production. These Luddites, pagans who worship Mother Gaia over all else, are allowed by the left to use any method to destroy the nation's ability to produce our own energy. For example, when Sarah Palin was Governor, the Bush administration, under pressure from radicals, was about to put the polar bear on the endangered species list. Never mind there was no science to back this move up. In fact, there is a bit of a population explosion going on among these bears, and their numbers a steadily increasing. The species is very healthy. Governor Palin successfully sued the Bush administration on behalf of the state of Alaska. Had the radicals prevailed, it would have all but stopped all oil and natural gas exploration in Alaska forever. Would have pretty much destroyed the state and it's citizens. Right now the radicals are trying to shut down the entire economy of West Texas over some sand lizard. It's insane. I have a serious question for any liberals who might be reading this. Thanks to liberals, it's almost impossible to teach children about God, or even mention his name in school, without having the ACLU, the Justice Department, and liberals in general losing their minds. HOWEVER, Darwin's completely unproven theory of evolution is taught as fact, pretty much shoved down every school kid's throat. One of the major tenets of Darwinism is "Survival of the Fittest." In other words, species that can't hack it, don't deserve to survive and we shouldn't lose any sleep over it. Species were coming and going millions of years before man ever walked the earth, and we are regularly discovering hundreds of new species we never knew existed. If Darwin is the end all be all, then who are WE to interfere? If something ceases to exist, then something will take it's place. It's just that simple. As liberals worship all things Darwin, why then, do they interfere with what is his major teaching, that species evolve and the weak die off? It amazes me the amount of sleep these radicals lose over this stuff, when their "religion" teaches them that these things happen. Maybe it's not the animals' health they care about at all, but the animals' ability to serve as a useful tool to help them advance their radical agenda for the world. Oh, and it's not just energy these environmental loons have destroyed. These menaces to society, in their zeal to destroy anything even remotely productive, turned the entire Central Valley of California, some of the most fertile farm land in the world, into desert, millions of acres of desert, over a three inch bait fish, that is not even native to the area! Billions of dollars have been lost, unemployment in the area is above 40 percent, and families who have owned farms for generations are either losing them, or about to. And the state and the federal government has the environmentalists' back. They support the eco-terrorists 100 percent. All of these things effect the price of gasoline, the lifeblood of our society. How do we fix it? Clean house in Washington, and in the state capitols! Elect leaders who value common sense over radical ideology. Elect leaders who understand basic economics. Elect leaders who want to see America and her people prosper. Elect leaders who understand what "Dill baby, drill" really means. We are not going to change this over night, but energy security, in an increasingly unstable and unpredictable world, equals national security. It also means economic security for the entire nation. There is no reasonable excuse for an America that isn't 100 percent energy independent. None whatsoever. I hate litmus tests for candidates, but if someone isn't 100 percent on board with doing whatever it takes to make the United States energy independent and do it now, then they are not worth looking at. Especially presidential candidates.